Maybe even Nintendo was surprised by the success of its nostalgic Classic Mini console, and it got us thinking about what other bits of retro tech we could bring back from history, from our favourite phones of decades past to one of the best games consoles of the 90s. It's not difficult to see why point-and-shoot cameras have been made redundant now that we're all carrying smartphones in our pockets, but even though photography is a lot more convenient and instant nowadays, it's also lost a little bit of the magic along the way. Cameras that pump out instant prints are great for weddings, parties, holidays and more, which is why we think instant cameras still have a place in a smartphone world - and some people obviously agree with us, hence the appearance of devices like the Polaroid Pop. The Nokia N95 was a smartphone before smartphones took off, packed with so much forward-looking tech that it was head and shoulders above a lot of the other mobiles on the market at the time - it went on sale in 2007, the same year as the first iPhone. Okay, the iPhone won out in the end, but the N95 actually out-specced it, with GPS and turn-by-turn navigation, a media player with buttons, a web browser, video recording and a 5-megapixel camera. It's a lot better than the recently revamped Nokia 3310, anyway. We've already talked about instant cameras bringing the magic back to photography, and typewriters would do the same job for writing: something to get your words and thoughts down on the page without any screen glare or any distractions from the web at large. Sure, replacing the ribbons was annoying, and the clickety-clack wouldn't go down well at your local coffee shop, but for writing and nothing but writing they could still do a job - perhaps that's why the Freewrite typewriter raised so much money on Kickstarter. 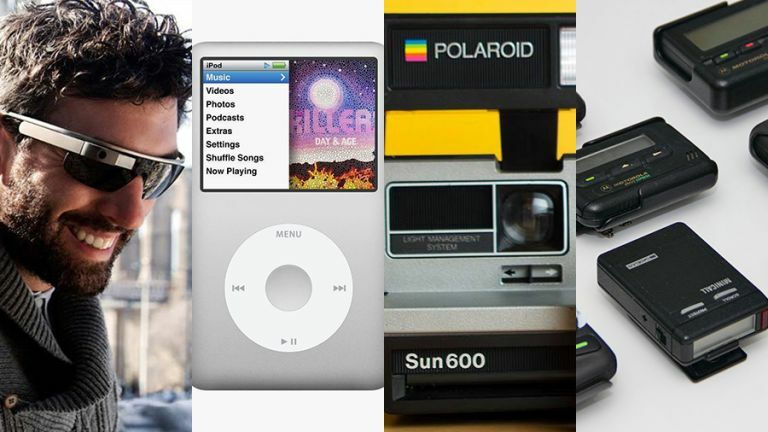 No one really needs an iPod these days - not if they own a smartphone and a Spotify subscription at least - but that doesn't stop us wanting one anyway. The iPod wasn't just about the music, it was about the intuitive controls and the huge amounts of storage too. Apple has long since discontinued the iPod Classic of course but we think it deserves a comeback - gigabytes upon gigabytes of locally stored music ready for playback, without the distraction of incoming Snapchats and phone calls. Make it happen, Apple. Speaking of escaping from a world of distraction and information overload, there could well be a case made for the return of that most 80s and 90s of gadgets, the pager - the way many of us stayed in touch while on the move, before smartphones became ubiquitous. Of course mobile phones can do the same job as a pager and so much more, but there's something to be said for a device that pings you when you're really needed and stays out of the way the rest of the time - and that lets you occasionally unplug from the grid too. Nintendo has dipped its toes into the retro console market, so why not Sony? Surely if the company does get involved, the original PlayStation from way back in 1994 has to be near the top of its shortlist - the first video game console to ship more than 100 million units. With breakthrough graphics, CD-quality music, a controller design that's still being copied today, and some top-notch games, the PlayStation really did change gaming forever. No doubt today the same gaming tech could be packed into a case the size of a matchbox. Admittedly, Google Glass was a complete flop (and perhaps doesn't qualify as "classic" just yet), but we think the idea had merit - and Snapchat Spectacles show the basic concept can work. It's likely only a matter of time before something Glass-like reappears. We're all taking more photos and videos than ever before, and when someone does build a wearable that's not obtrusive and ugly, the idea of holding up a phone to take a shot is going to seem quaint and old-fashioned... so give it another go, Google. We'll buy one.